This has been an important, madly busy week for our new Local Digital Collaboration Unit. 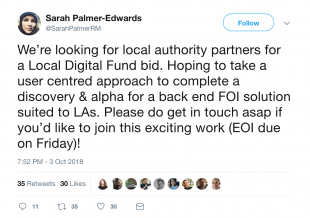 In just a 2-week period, we received 389 unique expressions of interest in running collaborative Local Digital Fund projects from 171 organisations. This included at least 1 application from close to 45% of principle English local authorities (districts, unitaries, metropolitan and county councils). Our next task is to publish the whole lot on our website. There’s a lot more data in there than we banked on (a thrilling problem to have), and it’s not all free from personal data. So the team are working overtime to clean, tag and categorise it, as we want to make it as easy as possible for you to interrogate. The hope is that by exposing all the ideas that came in, we can help to connect people with similar missions, and even leverage some further support from the market for projects that we can’t fund ourselves. We’re aiming to get a first iteration of this entire database on our website in the next few days. But before we do, there are some important health warnings that any data-miner or potential fund recipient should bear in mind. In an earlier blog post, I described the mission of our new Local Digital Collaboration Unit as radically different to other public sector reform initiatives. We aren’t the same as a central digital service for local that builds everything ourselves. Rather, we aim to help the local public sector to ‘wiki-fix’ its digital plumbing, working together in a devolved way to solve common problems. This means creating the conditions for cohorts of service transformers all around the country to lead on developing the different tools and standards everyone needs to build truly adaptable, user-centric, data-driven public services. Our theory is that by providing some light coordination, guidance on how to develop common patterns and data standards, and by running some exemplars from the centre from which we can all learn, we can collectively shed our reliance on inflexible legacy IT far more quickly than were we to try a centrist approach. This wiki-fix approach will only work if the social media atmosphere is safe and supportive. Our ability, as the local digital community, to collaborate easily requires the open internet. So, with great broadcasting power comes great responsibility, and we really hope everyone can do their part to keep the tone open-minded, collaborative and supportive. There are ideas of all kinds and varying quality in our database. Some aren’t articulated as Declaration-compliant projects that aspire to produce open standard, sharable tools. But there’s enormous value in all the data - especially when it’s combined. Those who were brave enough to submit a public application form deserve all the praise and support we can give. This is a trend we need to keep building. Within a year, we believe that this open approach will be delivering great benefits to the public and private sectors alike, and we’ll be investing a lot in tracking and communicating these benefits. In short, by reinforcing open working, we’ll learn more, achieve more, and make people’s lives better together. We’re about to publish one of the richest statements of local authority ambition going. The idea is to kick-start a fundamentally different way of ‘fixing our local digital plumbing’ to unleash the next revolution in public service delivery. There is a lot that data miners can learn from this database. So, in the spirit of our wiki-fix mission, we ask that whether a public, private, or other sector miner, you publish your insights openly and constructively, to help improve your product, and help us all learn from you. We haven’t come up with a prescribed way to do this. All ideas welcome! 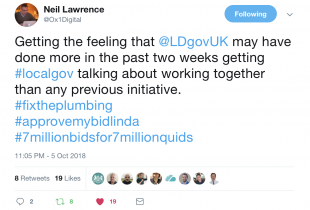 For now, great if you could tag your blogs and insights in links on Twitter using our handle @LDgovUK, and hashtags #LocalDigitalFund and #FixThePlumbing. Tuesday 16 October: We’ll notify the cohorts we’re inviting to submit a full application in group emails. We’ll also loop in applicants who didn’t meet the criteria to proceed, but who could collaborate with successful applicants on a common project bid. Or, for those who aren’t invited to submit a full application, we’ll return a high level explanation of why you were not invited to proceed this time around, highlighting the criteria that the proposal failed to meet. For this category of applicant, we hope that our online publication of bids will help progress their projects regardless, either securing support from elsewhere, or developing their thinking in time for the next round of funding in 2019. Tuesday 23 October: By this point, we’ll have all expressions of interest online, helpfully named, tagged and categorised by service type to help you see what kind of ideas we received. We really encourage all applicants to leave some kind of contact details in the comment boxes on their project page so that others can get in touch about joining in on the full application. Thursday 15 November: This is the revised deadline for receipt of full applications. Once those invited to proceed have worked out who’ll lead their bid and who they’ll collaborate with, they’ll be given private links to an online application form. We’ll need to receive completed applications by 4pm on Thursday 15 November to consider them for this round of funding. The team will be blogging again soon to share some early analyses of the proposals we got in. To make sure you’re the first to know about all our blogs, announcements, events and the like, register for our fortnightly newsletter, and subscribe to the blog! Glad to see Brighton get through the first hurdle with our data sharing project. Exciting times!